1. Today is a historical occasion when the Royal Government of Cambodia of the fourth legislature of the National Assembly holds its first cabinet meeting. As Prime Minister of the Kingdom of Cambodia, I am pleased to extend to all of you, colleagues­ members of the Royal Government of the fourth legislature, my greetings, warm welcome and best wishes. 2. To begin with, I would like to extend my profound gratitude to all compatriots who have once again for the fourth term, through the general elections held on 27th July 2008, reiterated their confidence in me personally to serve the nation as the Prime Minister of the Kingdom of Cambodia. The general elections on 27th July 2008 were upheld as open, free, fair and transparent. It was once again recognized as the “Miracle on the Mekong”. The new Royal Government of Cambodia, created by the free will of our people, resumes its duties in the fourth legislature with renewed dynamism and commitment to building’ and developing our country. 3. May I take this occasion of the first cabinet meeting to announce to our compatriots and development partners the prioritized policies of the Royal Government of the fourth legi­slature and its unwavering commitment to continue implementing reform programs in various strategic fields. This is to serve the interests of the nation and respond to the aspirations of the people who have given the Royal Government this sacred duty by the vote of their confidence through the process of free and fair election. 4. I reiterate once again that reform is the matter of life or death for Cambodia. In this sense, Cambodia has no other choice than continuing with firm and conscientious implementation of all needed reform programs. Deepening and expanding compre­hensive implementation of these programs are the pre-requisites to ensure effectiveness and efficiency in sustaining high economic growth and reducing people’s poverty. Indeed, this need is becoming even more relevant the current context of Cambodia and the world. 5. In this spirit, the “Political Platform” of the Royal Government of the fourth legislature has been formulated and endorsed through a comprehensive review of the predominance during the third legislature, people’s will and desire, the national and international context and the prioritization of strategies for all key sectors. Our development policy has been fine-tuned to highlight the socio-economic policy agenda of this political platform and to develop systematic, coherent, interrelated, com­plementary, and simplified priority packages within key sectors. Through this socio-economic policy agenda, the Royal Govern­ment reiterates its mission statement and firm determination in continuing the reforms in order to strengthen good governance and stimulate high economic growth, the most important factors to ensure sustainable development and poverty reduction. 6. In this context, I would like to propose to our first cabinet meeting, compatriots, development partners, public and private sectors, and civil society organisations, that we will continue to implement the” Rectangular Strategy” for Growth, Employ­ment, Equity and Efficiency – Phase IIwhich is the “Socio­economic Policy Agenda” of the “Political Platform of the Royal Government of the fourth legislature of the National Assembly”. 1) Peace, political stability, security and social order have been strengthened by implementing the liberal multi-party democracy. 2) Respect for human rights and dignity, including political, economic and social rights, has been en­hanced; and decentralization and de-concentration reforms, aimed at strengthening democracy and efficiency of local public services, have been initiated. 3) Good governance through state reform, especially civil service reform, legal and judicial reforms and armed forces reforms, has been strengthened to ensure that all government activities are increa­singly more transparent, accountable, predictable, effective and efficient. 4) Macro-economic stability and unprecedented high, double digit economic growth has been ensured while maintaining low inflation and a stable exchange rate. Competitiveness of the national economy has been strengthened by improving agricultural productivity, building a rural economic base, and expanding the industrial sector, especially to further the dynamism of the garment sector. The services sector has also expanded rapidly. All these have created jobs and skills training for hundreds of thousands of youth. 5) Through the “Public Financial Management Reform Program”, budget credibility has been fundamentally achieved as reflected by substantial growth in government revenues and the rationali­zation of expenditure, especially to increase the current budget surplus, which contribute to expanding investments in the economic and social infrastructure aimed at enhancing public service and poverty reduction. 6) The Private sector has emerged as the “true engine of economic growth”, and made a very impressive contribution to socio-economic development, both in the physical economic sector and the financial sector. 7) The rehabilitation and construction of the major national road networks has almost been completed and attention is now being paid to accelerate improvement of provincial and rural roads. The irrigation, energy and telecommunication infra­structure has improved significantly. 8) Institutional and human resource capacity has been strengthened by concentrating on development of the education and health sectors. The obvious outcomes are the increase in the enrollment rates and the decrease in drop-out and repetition rates, infant and child mortality rates and HIV/AIDS infection rate. 9) Partnership with all stakeholders especially official development partners, private sector and civil society has been strengthened by setting up a range of effective mechanisms, allowing for mobilizing and coordinating cooperative financing and invest­ments. 9. With unwavering implementation of the “Rectangular Strategy”, the Royal Government of the third legislature has created a favorable environment and necessary conditions enabling Cambodia to step forward with increased hopes and strong confidence on the road of further reforms and development. 10. In this context, the Royal Government has adhered to the principle of national solidarity to rally all Cambodians, inside and outside the country, from all walks of lives and political tendencies, under the motto “Nation-Religion-King” with the objective to build and protect the nation and social achievements while ensuring the country’s independence, integrity, sovereignty, peace, democracy and progress. The Royal Government would like to express its most profound gratitude to His Majesty Preah Karuna Preah Bat Samdech Preah Baromneath Norodom Siha­moni, the King of the Kingdom of Cambodia for constant support and encouragement to all government’s activities following the path of wisdom and compassion of His Majesty the King Father Preah Karuna Preah Bat Samdech Preah Norodom Sihanouk, and Her Majesty the Queen Norodom Monineath Sihanouk. First- Despite remarkable progress in key reforms aimed at strengthening good governance, the quality, efficiency and delivery of the public service still remain as challenges and could not yet respond fully to the real needs of the people. The judiciary could not yet gain full confidence from the public. The develop­ment of legal framework has not yet been comprehensive, while law enforcement is still to improve. Second- The economy is narrowly based and driven by four main sectors: garment, tourism, construction and agriculture. The garment and tourism sectors are vulnerable to external risks. Agri9ulture, which shares 30% of the GDP and accounts for more than 60 percent of the total employment, has not reached its full potential. Third- Climate change, global economic imbalance and continuing and deepening financial crisis resulting in global economic slowdown as well as the increase in oil price, soaring food price and depreciation of US dollar have brought severe inflationary pressure on the Cambodian economy in the short and medium term. The increase in domestic demand as a result of recent high economic growth has also aggravated the pressure. These pose a threat to the growth prospects for Cambodia. Fourth- Although we have managed to reduce poverty rate from 47% in 1993 to 35% in 2004 through high economic growth and pro-poor policies and preliminary estimates indicate further decrease in poverty rate to 32% in 2007, the rural poverty rate remains high. Furthermore, the gap between the rich and the poor, especially urban-rural inequality remains a challenge. Fifth- Land concentration and landless people are on a rising trend, adversely impacting on the equity and efficiency of land use. On the other hand, large areas under economic land concessions have not been utilized efficiently as targeted, needing strict government measures to tackle them. Sixth- The anarchy in illega11and possession, illegal claim of state land and protected areas as privately owned and unlawful logging are still taking place. At the same time, poverty and internal migration have added pressure on natural resources and places them at risk of destruction. Seventh- Having achieved great progress in the rehabili­tation and reconstruction of the national road network across the country, our next challenges are to ensure traffic safety and proper maintenance of the entire road network across the country. Eighth- The aviation sector plays a crucial role in tourism development. Further development of aviation infrastructure, in­cluding continuous improvement of flight safety, still continues to be a key priority to ensure the tourism development and absorp­tion of increasing number of tourists to Cambodia. Ninth- Electricity tariff remains high compared to neigh­boring countries, and is a big obstacle in strengthening the Cam­bodian competitiveness as well as attracting investments and improving livelihoods. Access to electricity in rural areas is still limited. Tenth- Irrigation system has not been fully developed and utilized to its potential, requiring more efficient management and investment. Eleventh- Financing, management, and technology are the major challenges for SMEs in Cambodia. Twelfth- The social safety net for workers and the poor has not yet become an efficient system. Thirteenth- The quality of education at primary, secondary and tertiary levels is low. The production and trafficking of illegal drugs has become a social problem which harms welfare of the Cambodian youth at present and in the future. Fourteenth- The shortages of technicians and skilled workers are a major obstacle to accelerating economic develop­ment in both urban and rural areas. Fifteenth- The provision of quality public health services is still limited. In spite of numerous achievements in the health sector, the maternal mortality rate is still high. The progress in promoting health care services, sanitation and clean water in rural areas is needs to be speeded up to meet the targets set in the Mil­lennium Development Goals. Sixteenth- Lack of education, domestic violence and human trafficking are the major factors that handicap women from realizing their full potential in contributing to socio-economic development. Seventeenth- In general, institutional capacity of the Government is still limited due to low salary and incentive schemes. The cooperation between government agencies is still inadequate, while some legal and regulatory frameworks contain loopholes, and there is a shortage of resources to carry out our policies. 12. The over-riding goal of the Royal Government of Cam­bodia is to firmly and steadily build a Cambodian society which enjoys peace, political stability, security and social order, and sustainable and equitable development, with strict adherence to the principles of liberal multi-party democracy, respect for human rights and dignity; and a society in which social fabric will be strengthened to ensure that the Cambodian people are well educated, culturally advanced, engaged in dignified livelihood and living in harmony both within family and society. First­ – Ensuring sustainability of peace, political stability, security and social order through specific measures aiming at promoting the rule of law, respect for human rights and dignity, liberal multi-party democracy in order to create a favorable security and poli­tical environment for long-term sustainable development. Second – Ensuring sustainable long-term economic growth at around 7% per year on a broader and more competitive economic base in the context of low, single-digit inflation, stable exchange rate and steady increase in interna­tional reserves. Third – Ensuring equitable distribution of opportu­nities and the fruits of the economic growth. Fourth – Ensuring environmental sustainability, espe­cially through sustainable management and use of natural resources. First – The need to continue strengthening and ex­panding the achievements made by the Royal Government in implementing the “Rectan­gular Strategy” during the third legislature. Second – As emphasized earlier, the implementation of the “Rectangular Strategy” during the third legislature has brought up numerous chal­lenges requiring the Royal Government to improve and refine, its prioritized policies and to accelerate the implementation of this policy agenda during this legislature. Third – Continued implementation of the “Rectan­gular Strategy-Phase II” is a further step to achieve the “Cambodian Millennium De­velopment Goals”. Fourth – The will and aspirations of the Cambodian people coupled with changes in the world and domestic situation in Cambodia need to be addressed by the improved and refined “Rectangular Strategy” and its implement­ation in the second phase. 15. The Royal Government recognizes the need to ensure consistency in terms of hierarchy, role, substance, coherence and synchronization between the “Rectangular Strategy”, the “National Strategic Development Plan”, and the Sectoral Development Strategies, as well as other policy documents, investment programs and the national budget. This calls for a review of the timeframe of the “National Strategic Development Plan” and “Political Platform of the Royal Government”which includes the “Rectangular Strategy” as its socio-economic agenda. 17. The Rectangular Strategy-Phase II maintains the earlier structure and fine-tunes and sharpens the prioritized policies in responding to the current conditions as highlighted earlier (Description of the structure of the Rectangular Strategy is illustrated in the box below and its diagram is attached). First, the core of the Rectangular Strategy is Good Governance, focused at four reform areas: (1) Fighting corruption; (2) legal and judicial reform; (3) public administration reform including decentralization and deconcentration; and (4) reform of the Royal Cambodian armed forces. Second, the environment for the implementation of the Rectan­gular Strategyconsists of four elements: (1) peace, political stability, security and social order; (2) Cambodia’s integration into the region and the world; (3) partnership in development with all stakeholders, including the private sector, donor community and civil society; (4) favorable macro-economic and financial environ­ment. Third, the four strategic “growth rectangles” are (1) enhance­ment of the agricultural sector; (2) further rehabilitation and construction~ of the physical infrastructure; (3) private sector development and employment; and (4) capacity building and human resource development. · Rectangle 1: Enhancement of the Agricultural Sector covers: (1) improving agricultural and diversification; (2) land reform and clearing of mines; (3) fisheries reform; and (4) forestry reform. · Rectangle 2: Further Rehabilitation and Construction of the Physical Infrastructure includes: (1) further restoration and construction transport infrastructure (inland, marine and air transport); (2) water resources and irrigation system manage­ment; (3) development of the energy sector; and (4) develop­ment of Information and Communication Technology. · Rectangle 4: Capacity Building and Human Resource Development consists of: (1) strengthening the quality of education; (2) enhancing health services; (3) implementation of gender policy; and (4) implementation of national popula­tion policy. 18. Good governance is the most important prerequisite to ensure socio-economic development with sustainability, equity and social justice. Good governance has been continuously strengthened through a number of reforms in key sectors, inclu­ding fighting corruption, legal and judicial reforms, public admini­stration reform, and armed forces reform. Indeed, the public fina­ncial management reform, land reform, and forestry and fishery reforms have significantly contributed to strengthening good governance and fighting corruption. In the fourth legislature, the continued governance reforms by the Royal Government will place importance on the enhanced effectiveness in implementation of policy and delivery and management of public goods, especial­ly a better public services delivery in order to respond to the aspirations of the people. 19. The Royal Government of the third legislature has taken numerous practical measures to tackle corruption. In this regard, even in the absence of the Anti-Corruption Law, the Royal Government has vigorously combated corruption through the introduction of Governance Action Plan and the adoption and implementation of a number of measures such as Law on Public Financial System, Law on Customs, Sub-decree on Public Procu­rement, Order on the Management of Non-tax Revenues, and Code of Conduct and Ethics for Customs Officials. Along with this, the control mechanisms of the National Audit Authority and of inspection were strengthened, and internal audit mechanisms have been established in all ministries/institutions. The Anti­-Corruption body has been strengthened and administrative and legal actions have been taken against officials found indulging in corrupt practices and punishment meted out. 20. Fighting corruption continues as a high priority for the Royal Government of the fourth legislature. We are aware that the Anti-Corruption Law provides an important legal instrument to fight corruption effectively. In this context, the Royal Government is strongly committed to develop and adopt this law in close consultation with all concerned parties on the basis of all other fundamental laws that must be adopted before hand. This well­ sequenced process will ensure coherence and consistency among different laws and their effective implementation. (1) Preventative Measures: The Royal Government will continue to raise awareness about all aspects of corruption, inclu­ding its causes, impacts and consequences to encourage public participation in preventing and fighting corruption. Concrete measures will be pursued to encourage all levels of government officials to adhere to dignity, mortality, professionalism and responsibility in fulfilling their duties. (2) Strengthening accountability and institutional capa­city: The Royal Government will focus on improving its effect­iveness in avoiding conflict between the public and private interests by adhering to the principle of incompatibility between functions, especially incompatibility between political and public servant positions; and between political or public servant positions and private activities. The Royal Government will also reduce and eliminate the use of public positions, influence and power which blur or bias the decision-making process. (3) Public support and participation: Public support and participation is sine qua non for effectively preventing, reducing and fighting corruption. For this, the Government will continue to further promote and protect the freedom to seek to obtain and to disseminate information on corrupt cases in the media. However, this should be done in a credible and responsible manner by respecting the rights, honor and dignity of people involved while protecting national security and public order. (4) Private sector participation: The Royal Government will continue to develop and pursue implementation of policies, legal and regulatory framework and procedures to protect the integrity of the private sector in order to prevent collusion and to ensure fair competition between private companies/enterprises by ensuring proper behavior, honorable conduct and dignity in all business transactions. The Royal Government will safeguard the balance between the rights and interests in the contracts made between the public and private sector. (5) Strengthening of law enforcement: The Royal Government will take strict legal measures against the culprits in order to eliminate the culture of impunity, reduce corruption and increase public confidence. 22. The Royal Government has improved legal and judicial systems by focusing on the development of a sound legal framework and modernization of the laws, as well as by laying out necessary strategies and measures to enhance the competence, independence and impartiality of the judiciary, which are crucial to strengthening the rule of law. In the third legislature, a total of 140 laws were promulgated including three major codes- the Criminal Procedure Code, the Civil Procedure Code and the Civil Code. The Royal Government has focused on improving the judiciary by enhancing the competency and accountability of judges through initial and continual training and the adoption of the Codes of Ethics for Judges and Prosecutors. Disciplinary measures have been carried out by the Supreme Council of the Magistracy. The Royal Government has also established centers for legal services in the number of the district in order to institutionalize dispute resolution mechanisms outside the court system in Cambodia in order to reduce the backlog at the courts. 23. The Royal Government will continue implementing the legal and judicial reform strategy in order to achieve its seven strategic objectives. It will also focus more on the early adoption of major fundamental laws such as the Penal Code, the Anti-­Corruption Law, the Law on the Statutes of Judges and Prose­cutors, the Law on the Organization and Functioning of the Courts and the Law on the Amendment of the Law on the Organization and Functioning of the Supreme Council of the Magistracy. At the same time, the Royal Government will continue to organize pro­grams to disseminate knowledge of laws and procedures to the public and provide legal training to law-enforcement officials with the aim of improving awareness and proper enforcement of the laws. In the fourth legislature, the Royal Government will conti­nue to address the following priorities: (1) enhancement of the competency of Judges and Prosecutors through continued high quality training and initial professional training, and enhancing the accountability of judges and prosecutors by promulgating the statutes for Judges and Prosecutors, and by taking strict disciplinary actions in close cooperation with the Supreme Coun­cil of the Magistracy; (2)development of the support mecha­nisms to serve the judicial sector- including the introduction of the statutes for the court clerks, the notaries and the bailiffs; and the operational functioning of professional training schools for the above officials in order to ensure their proper qualifications and professionalism; (3) provision of legal aid- especially through provision of lawyers to poor citizens to help protect their rights and interests at court; and, (4) further promotion of the mechanisms for dispute resolution outside of the court system in order to improve and strengthen the culture of harmonious co-existence of people in peace and solidarity. 24. The Royal Government has launched Priority Mission Groups (PMGs) in a number of ministries and agencies in order to strengthen institutional and professional capacity, introduced selection criteria and competitive examinations for the recruitment of government officials, increased social security and functional allowances, and piloted the Merit-based Payment Initiative (MBPI) aiming at improving the efficiency, transparency and the responsibility of the public services. The “Single Window” mechanism has been launched to facilitate the public service users while the decentralized public services at commune/sangkat level and public service provision through information technology are also offered. The Public Financial Management reform has enabled the Royal Government to achieve budget credibility through improved revenue management and expenditure rationali­zation. This has facilitated increase in the average monthly salary from 30 USD in 2004 to 62.4 USD in 2008, a more than two fold increase. 25. In the fourth legislature, the Royal Government will continue to expand the coverage of the PMGs and MBPI to a number of priority ministries and agencies, in order to deepen nationwide sectoral reform programs. The Royal Government will pursue the increase in base salary of20% per annum, compared to 10-15% in the third legislature. The Royal Government will continue to enhance the efficient use of information technology; implement improved personnel management and the capacity building for government officials; increase roles and participation of women in public administration; enhance provision of basic public services, government sovereignty services, investment related services, and support to small and medium businesses through the implementation of the “Single Window” mechanism; and to pursue the establishment of Ombudsman offices. The Royal Government will also set up new mechanisms in providing public services through the creation of the “Special Operation Agency” in a number of ministries and agencies, and will encourage the civil society and private sector to participate directly in providing public services. 26. The Royal Government will further pursue the Decen­tralization and De-concentration policy by developing legal and regulatory framework and laying out new measures to ensure effective implementation of the “Organic Law on the Admini­strative Management of the Capital, Provinces, Municipalities, Districts and Khans”, especially the development and implementation of the legal and regulatory framework related to the transfer of power from the national to sub-national administrations by clearly identifying roles, authority, power, and accountability. This law will be carefully implemented in phases. Each ministry and agency should prepare concrete Action Plans for the delega­tion of power and functions to the sub-national levels. Decentra­lized financial management will also be implemented in a phased and flexible manner over the medium term to allow for the capa­city building at the sub national levels. The National Committee on Sub-National Democratic Development is preparing a 10­year National Implementation Program. 27. The Royal Government has implemented on schedule the reform programs and strengthened the capacity of the Royal Cambodian Armed Forces. This includes the demobilization and the restructuring of combat units from divisions to battalions, the merger of battalions, the training of professional soldiers and experts, anti-terrorist training and mine clearance training, reform in the management of weapons and ammunitions, participation of the engineering units in the rehabilitation of infrastructure, and the training of RCAF units for participation in UN peacekeeping work, especially in mine clearance, engineering, the protection of security and social order, in particular in combating woman, child and drugs trafficking. (1) Continued strengthening of the armed forces to be highly professional, capable of carrying on their designated mis­sions by equipping them with technology and proper hardware, and by inspiring them to strictly abide by the laws, to respect human rights, to bear full loyalty to Nation, Religion, King, to sacrifice for territorial integrity and the interests of the nation and the people, to strengthen social, and moral norms, and always observe professional code of conduct, all in order to increase and maintain full public confidence in the armed forces. (2) Continued improvement of cooperation among and between all categories of armed forces, and between the armed forces with other relevant ministries and agencies for the cause of peace, political stability, security, and national unity. The Royal Government will continue to promote the tradition of close relationship between the armed forces and people by strengthening the former’s capacity in rescue and humanitarian operations, as well as in agricultural production. At the same time, the Royal Government will continue good cooperation with the international community in protecting and preserving peace and international security, in particular in preventing and cracking down on ter­rorism, and all kinds of transnational crimes, including drugs and human trafficking. (3) Pursuit of the development of strategic plan for the National Police Forces aimed at enhancing their effective, commanding roles to fulfill all assigned functions by ensuring management of human, financial and other resources. The Royal Government will also accelerate the development Of the Law on the National Police Forces which will become a guiding frame­work, enshrining their rights, obligations, duties and responsibi­lities. 29. During the third legislature, the Royal Government has strengthened peace, political stability, security and social order in order to achieve macroeconomic stability, development and poverty reduction. As a result, Cambodia has managed to increase the confidence of investors and tourists as reflected in the increase in investment and the number of visitors into Cambodia. At the same time, Cambodian people are able to carry on their normal lives and actively participate in the country’s economic develop­ment according to their ability. Socio-economic development in turn forms the foundation for a lasting peace, political stability, security and social order. 30. The Royal Government, therefore, will continue its efforts to further consolidate peace, political stability, security and social order to ensure fundamental conditions to build and reform the state in order for Cambodia to move further forward on the path of development and prosperity. In this spirit, the Royal Government will do its utmost to strengthen security and substantially reduce crimes, promote the “Rule of Law”, enhance the respect for human rights and dignity in all aspects and open up equitable opportunities to Cambodians from all walks of life. 31. During the third legislature, Cambodia has actively parti­cipated on equal footing and with equal rights in the ASEAN, WTO as well as in other sub-regional, regional and inter-regional and global cooperation initiatives such as the Greater Mekong Sub-region (GMS), Ayeyawady-Chao Phraya Mekong Economic Cooperation Strategy (ACMECS), Asia-Europe Meeting (ASEM) and others. Cambodia’s integration into the region and the world and linking trade to labor standards have created a favorable environment for the development of agriculture, tourism, and industry, especially the garment industry, and have facilitated Cambodian farmers to’ export their products to the regional and world markets. Also, Cambodia’s membership in the WTO has accelerated internal reforms, attracted both domestic and foreign investments, and strengthened the foundation for socio-economic development. 32. Since trade is a major source for economic growth and poverty reduction, the Royal Government will make further strides on the path of trade liberalization aimed at free movement of goods and services within the country and between Cambodia and her trade partners. The Royal Government will continue to create access for Cambodian products, without barriers and obsta­cles, to extensive regional and world markets. This will create opportunity to avail of economies of scales and bring other bene­fits to Cambodian economy in terms of increase in investment, jobs, income and economic growth as a whole. All these are critical to reduce poverty among our people. 33. In this spirit, the Royal Government of the fourth legisla­ture will pay priority attention to the further integration of Cam­bodia into the region and the international community by pursuing membership of Asia-Pacific Economic Cooperation (APEC) forum and participating in the building of the ASEAN Community. In this context, it is necessary for all ministries/agencies to pay attention to and fulfill the duties of Cambodia’s membership in the WTO by adopting laws and regulations and ensure their effective enforcement to meet the requirements of the WTO. 34. The Royal Government has scored many achievements in strengthening partnership with all development stakeholders, including the development partner community, the private sector and the civil society based on basic principles and global commit­ments to assure ownership of the Royal Government in leading the national development process. 35. Cambodia has succeeded in organizing consecutive Con­sultative Group meetings with development partners and also turned this process into the “Cambodia Development Cooperation Forum -CDCF”. The first CDCF meeting was held in Phnom Penh on June 19, 2007, with the Government taking the lead and ownership. At the same time, progress in the implementation of reform programs, especially the laudable performance of the first platform of the Public Financial Management Reform Program is an example of such successful partnership between the Govern­ment, on the one hand, and the development partner community, the private sector, and the civil society on the other. 36. The Royal Government will continue to strengthen the mechanism of “Cambodia Development Cooperation Forum ­CDCF” and “Government-Private Sector Forum” and consider the possibility to transform all these fora into the” Cambodia Development Forum “, which will serve as a mechanism for the Government and all development stakeholders, including develop­ment partner community, private sector, civil society, and as well as other concerned stakeholders to discuss issues related to both public and private sector development. The coordination mecha­nism of the Coordination Committee between the Royal Govern­ment and Development Partner Community (Government ­ Development Partner Coordination Committee- GDCC and the Technical Working Groups – TWGs) will be reviewed and further strengthened in order to enhance efficiency, especially on technical cooperation for development of human resources and institutional capacity and to strengthen cooperation among all relevant stakeholders. The Royal Government will continue to encourage NGOs and Associations that have been legally establi­shed and operate based on good governance principles to engage in the process of socio-economic rehabilitation and development, to promote democracy and the respect for human rights and dignity as well as to participate with the Royal Government in monitoring the implementation of various policy strategies. The Royal Government will continue to pursue the adoption and implementation of a Law on Non-Government Organizations (NGOs) and Associations in close consultation with relevant agencies and organizations. 37. The Royal Government is committed to implement” the Accra Agenda for Action” which represents the consensus at the third High Level Forum on Enhanced Effectiveness of Official Development Assistance (ODA) in order to strengthen national ownership and leadership, and partnership and transparency with all development partners as well as to enhance result-based management. 38. The Royal Government has succeeded in maintaining macroeconomic stability with economic growth averaging at 11.1 % from 2004 to 2007, which is higher than the original target of 6 to 7% per annum. This has resulted in increase in the GDP per capita from 394 USD in 2004 to 594 USD in 2007. The interna­tional reserves have also more than doubled and reached almost 2 billion USD in early 2008. Inflation has been kept under check, below 6% per annum, and the exchange rate has been broadly stable. Foreign Direct Investment (FDI) inflows increased more than seven folds from 121 millions USD in 2004 to 867 millions USD in 2007. Since the implementation of the Public Financial Management Reform Program, the budget revenue has increased on average by 26% per annum. The budget has been transformed from a chronic cash deficit to a cash surplus, thus making the budget become more credible. At the same time, the Royal Government has successfully implemented the action plan spelt out in the “Vision and Financial Sector Development Plan 2001­2010″, which was updated into the “Financial Development Stra­tegy 2006-2015 “. 39. The Royal Government will make further strides to achieve high economic growth within the range of7% per annum, on a broader basis and stronger competitiveness within the context of low, single-digit inflation, broadly stable exchange rate, and steadily increasing international reserves. The Royal Government will pursue prudent monetary and budgetary policies in order to consolidate macroeconomic and financial stability by focusing on packaged measures to check inflation and/or influence its effects on the prices of basic goods such as food and fuel by implement­ing austerity measures and rationalizing consumption, as well as measures to cool down the economy in general. The Royal Government will continue to invest in physical infrastructure such as roads, irrigation systems, and electricity supply system, which can cut down costs and enhance productivity and economic efficiency as well as increase investment to promote agricultural productivity to be able to respond to the increasing food prices and to avail of the opportunity of higher demand for food in the world, thus promoting agricultural development in Cambodia. 40. In order to ensure sustainable economic growth, which is sine qua non for employment creation and income generation, the Royal Government will continue to foster the diversification and strengthen the competitiveness of the Cambodian economy by assuring a highly conducive climate for both public and private (domestic and foreign) investments for the development of the following important sectors: (1) Agriculture, (2) Water and Irrigation System (3) Transport Infrastructure (4) Electricity (5) Human Resource Development (6) Labor-intensive Industry and Food Processing Industry for Exports (7) Tourism (8) Exploitation of Oil, Natural Gas and other Minerals (9) Information and Communication Technology, and (10) Trade. 41. The Royal Government will further strengthen the finan­cial sector through effective implementation of the” Financial Sector Development Strategy 2006-2015″ by placing particular emphasis on the banking sector, rural credit and micro-finance, insurance, and capital market development, including the esta­blishment of a special financial center to mobilize broader finan­cial resources. 42. The Royal Government will continue to deepen the imple­mentation of the “Public Financial Management Reform”, especially the second platform of this program in order to enhance the efficiency of the national budget, which is a key tool of the country’s development policy. To this end, the Royal Government will strictly abide by the “Ten Commandments” in managing the public finance in accordance with the rules and regulations of the Law on Public Financial System. The Royal Government will continue to strengthen the strict management of state-owned assets in accordance with the existing laws and regulations, and to ensure effective collection of revenues from all kinds of state-owned assets. The Royal Government will ensure the efficiency, tran­sparency and the accountability in financial management of the public administrative establishments. Also, the Royal Government will place priority on enhancing the efficient management of public enterprises by strengthening the management capacity of the tutelage ministries responsible for technical as well as finan­cial matters, and by adopting business plans, operational guide­lines and performance benchmarking and by strengthening control and audit. Attention would also be given to improving the management of public enterprises to enable them to reach the standards needed to mobilize financing from the capital markets. Moreover, the Royal Government will continue to strengthen the role of the Ministry of Economy and Finance in the review and the approval of all government contracts and concession agreements in accordance with the laws and regulations in force. 43. The Royal Government is committed to efficient, transpa­rent, and accountable management of the revenues from mineral, oil and gas exploitation. 44. Since Cambodia’s economic growth is narrowly based and the agriculture sector is the high labor absorbing sector, and in the context of increases in food price in the world, the development of agriculture, the core of rural economy, has two aspects: (i) to enlarge the base of, and help sustain, economic growth; and (ii) to accelerate poverty reduction. To this end, the Royal Government’s policy mainly aims at promoting agriculture productivity and diversification as well as land, fisheries and forestry reforms by addressing in package issues of agriculture technology, rural infrastructure such as roads, irrigation system and electricity and credits, markets and processing-technology, especially for exports. This requires institutional mechanisms and highly effective coordination for sector-wide progress and qualitative changes. 45. The value-added of agriculture increased on an average by 7.2% per annum between 2003-2007, compared to 1.6% during 1998-2002 and 4.9% during 1993-1997. Cambodia has achieved 2.5 tons per hectare of rice yield during the period 2005-2007, the highest yield in Cambodian history, due to increased investments in irrigation network, improvement in water management, increase in credit made available by commercial banks and microfinance institutions, and increasing use of better cultivation practices. Agricultural intensification has gradually taken roots. Moreover, the increase in prices of rice, maize, soybean, cassava and rubber provides further incentives to the implementation of agricultural diversification policy. 46. The Royal Government continues to place priority on increasing agricultural productivity and diversification as well as promoting agro-industries. The Royal Government will continue to pay further attention to increased production by shifting from extension of cultivated area to intensive farming on the existing land. This is to increase production, employment, and rural income, and ensure food security as well as to increase export of agricultural products, especially finished goods, in particular rice. This will be achieved through an integrated approach including increased proper use of improved agricultural inputs, agricultural extension, research and development, construction and main­tenance of the rural infrastructure, especially irrigation network, expansion of rural credit and microfinance, agricultural market development, organization of farmer communities and better management of agricultural land. To this end, the Royal Govern­ment will make further efforts to expand the system of technical and agricultural extension services by rolling them out to the district level and creating linkages with a community level volun­teer network as well as with the agricultural services being provided within the framework of various development projects. The Royal Government will foster partnership between small land holders and large-scale agricultural farms or corporations, and between economic and social land concessionaires, especially those involved in agro-industries such as rubber plantation in accordance with the Strategic Plan for the Development of Rubber, Cashew, and Sugarcane. The Royal Government will encourage multi-purpose farms in order to increase productivity in animal husbandry and multi-crops farming through integrated farming. 47. Moreover, the Royal Government will create an enabling environment to attract private investors, domestic and foreign, and welcomes the contribution from NGOs to ensure the transfer of know-how and new technology to farmers in regard to crop farming and animal rearing. It will further strive toward linking farmers to the regional and global agricultural markets by creating necessary institutional mechanism and through efforts to make the quality of agricultural products conform to international standards. 48. The Royal Government’s land reform program is focused on measures to strengthen land management, land distribution and land use, to ensure the security of land ownership, to eradicate illegal land holding, and to prevent concentration of unused land in few hands. Land reform is also crucial for the increase and allocation of agricultural land within the framework of granting social land concessions to farmers in order to enhance agricultural productivity and diversification. Land registration has achieved satisfactory progress by completing systematic registration in 175 communes/sangkats within 11 provinces and municipalities. More than one million land titles have been issued. 49. During the fourth legislature, the Royal Government will continue implementing land reforms within the framework of the Land Law and the existing land policy by developing additional legal and regulatory framework such as the Law on Expropriation, the Law on Pre-emption and Land Development, the Law on Construction and Urbanization and the National Construction Standards. 50. The Royal Government will review and take necessary measures to increase the efficiency in the management and utilization of state-owned unused land and take legal actions with regard to illegal holding of state-owned land by private indi­viduals. The Royal Government will accelerate the completion of the inventory of the state-owned immoveable assets. It will further speed up the systematic land registration by establishing a Single Window to ensure transparency. It will accord priority to the land conflict-free areas and areas inhabited by indigenous communities in order to reduce land conflict, ensure security of land ownership and, eliminate illegal land holding. The Royal Government will continue to resolve land conflicts by using legal mechanisms to ensure justice coupled with the out-of-court conflict settlement mechanism. The Royal Government attaches priority to granting land ownership rights to poor household and vulnerable groups for housing, farming and small businesses. 51. To ensure land use efficiency, the Royal Government will speed up the preparation of Land Use Map to enable orderly allocation of land for agriculture, industry, tourism, rural, urban, residential and reserved areas in order to prevent improper land use and land conversion. The Royal Government will review and regularly monitor the economic land concessions to ensure that they conform to the agreed upon priorities and to make them active as well as to avoid unproductive holding of land. 52. Progress in mine clearance is illustrated by a sharp drop in mine and UXO-related casualties, from 800 cases in 2003 to 315 cases in 2007. It also resulted in the expansion of road network, agricultural land and the accessibility to all comers of the country. During the fourth legislature, the clearance of mines and UXOs will remain government priority, especially in remote areas, areas with landless farmers and areas with high potential for agricultural and infrastructure development. Moreover, the clearance of mines and UXOs should be linked to the principles o( equitable distri­bution of cleared land to landless farmers. 53. Fish, a natural renewable resource, is very crucial to the livelihoods of Cambodian people in terms of food, income, and safety net. The Royal Government has distributed fishing lots to the people, and has established 509 fishing communities, both marine and fresh water. The objectives of the Royal Government are to maintain sustainability and to ensure regeneration of natural resources including preservation of fish resources in order to contribute to economic development, as well as to ensure the livelihoods of fishing communities. 54. The Royal Government continues to attach priority to helping and encouraging fishing communities to participate in the preparation of plans and the management of natural resources by guidance and technical training in order to ensure sustainable management of fishery resources based on technical standards. To this end, the Royal Government will ensure the proper demarca­tion of the fishing lots. 55. In order to ensure that the price of the fish reflects true economic value, the Royal Government will establish an effective fish market mechanism as fish is either income or expense for the poor. This market mechanism will include making the bidding process for the fishing lots more transparent, and will increase efficiency in the management of fishing lots while increasing the state revenue. 56. The Royal Government will further strengthen national resource conservation, especially promoting the linkage of conservation to eco-tourism. The Royal Government will continue to take serious action against illegal encroachment of flooded forests, use of illegal fishing gears, and all anarchic activities preventing the conservation efforts, by encouraging participation from relevant local and competent authorities. 57. The promotion of aquaculture is necessary to preserve fish resources for which the Royal Government will provide a package of assistance to fish farmers, which will include technology, seed, credit and market. The improvement in law enforcement through the existing mechanism continues to be the priority of the Royal Government in preservation of fisheries resources. 58. The Royal Government’s forestry policy is to ensure sustainable forestry management and the use of forests to improve the livelihoods of people living in rural areas and to contribute to economic growth. Besides banning logging for the present, the Royal Government has established protected and biodiversity conservation areas, undertaken reforestation, formed forestry communities, taken up proper boundary demarcation and strict measures to prevent, reduce and eradicate illegal encroachments and occupation of forest land by private individuals. 59. The Royal Government considers forest communities an important element in forest management. Accordingly, the Royal Government will continue to monitor and evaluate the effectiveness and efficiency of this program in terms of the improvement of livelihoods of the rural people, the sustainability of forest resources, and the expansion of forest communities. Moreover, the Royal Government encourages the private sector to establish commercial forest plantations in degraded forest land based on agreed technical standards. 60. The Royal Government will continue to monitor forest concessions to ensure that they comply with international standards by seeking external technical and financial assistance and by active and appropriate participation of civil society in monitoring. The Royal Government will continue to strictly enforce the Law on Forestry and take serious measures against forestry crimes, and will continue educate people to be aware of obligations to protect forests and stop illegal forest encroachments. 61. Since forest is crucial for the livelihoods of the people, the Royal Government will enhance management efficiency of the reserved forests and ensure their appropriate protection and development, including eco-tourism, for employment generation and additional income for the people. Moreover, attention will be given to the management of the protected areas. The Royal Government will mobilize resources, support, and financing to participate in global efforts to address challenges of climate change. 62. In the current context of Cambodia, transport network plays a role as “a Prime Mover of Economic Growth” and as arteries linking all parts of Cambodia to be a cohesive economic body, and to integrate the Cambodian economy into the region and the world. The Royal Government has so far almost completed the rehabilitation and reconstruction of important national roads. It will continue to give high priority to the rehabilitation and reconstruction of multimodal transport network connecting all parts of the country, and with neighboring countries. This will enable provision of convenient, stable, safe, economically effi­cient, lower cost transportation and logistics services network, aiming at trade facilitation, tourism promotion, rural development, regional and global economic integration as well as national defense. 63. The Royal Government will continue to accord high priority to the maintenance of national roads, the reconstruction of provincial and rural roads, the expansion of ports and the rehabili­tation of railways, also in order to connect to the rail network of the neighboring countries within the Greater Mekong Sub-region (GMS) framework. The Royal Government will make every effort to privatize the operations of Royal Cambodian Railway, and will encourage private sector participation in the rehabilitation of infrastructure and in transportation services. 64. The Royal Government will seek increasing private sector participation, through bidding processes, in routine and periodic road maintenance. It will further strengthen the management and technical supervision and audit capacity of the Provincial Departments of Public Works and Transport and the Provincial Departments of Rural Development. The Royal Government will continue to pursue the open sky policy, strengthen flight safety and enhance airport services. 65. The Royal Government will speed up the adoption of the Law on Roads as well as supporting legal and regulatory frame­work for efficient management of transport infrastructure. The Royal Government will place emphasis on traffic safety and stricter measures against transportation offences, including over­loaded carriers. 66. The Royal Government has rehabilitated existing and constructed more irrigation network and has taken other measures to maximize its full potential in order to solve the water needs of the agriculture sector. As a result, the capacity of water reser­voirs has expanded and the ability to provide water for cultivation has increased. The Royal Government has established water user communities with increasing participation from farmers. Provi­sion of potable water supply in the urban and rural areas has also been progressing well. 67. The Royal Government will continue to accord priority to the rehabilitation, construction, maintenance and efficient management of irrigation infrastructure, water reservoirs, canals, pipes, drainages, flood and sea protection levies, and water pumping stations to increase irrigated areas and boost agricultural production. 68. The Royal Government will pay more attention to the rights of access of people to clean water supply to ensure food safety and better livelihoods in accordance with the Cambodia Millennium Development Goals (CMDGs) and will also preserve the ecosystem of unpolluted water and clean environment. As part of the vision for the future in water management in the Mekong basin, the Royal Government will continue to take measures to rationalize water use in all water bodies, including rivers, lakes and the Tonle Sap Lake. 69. The Royal Government will enhance efficient management of the irrigation system by strengthening the institutional capacity of concerned ministries and agencies. It will further increase people’s participation in the decentralized management and use of the irrigation systems in order to address water issues for cultivation, facilitation of navigation and promotion of aquaculture, and will -strengthen the capacity of water user communities. Along with use of resources from development partners and its own resources, the Royal Government will encourage private sector participation in the development and the management of irrigation systems and clean water supply. 70. In the third legislature, the Royal Government has suc­ceeded in the rehabilitation of the electricity supply system and extended supply to some strategic regions. Some concrete achieve­ments include: (1) the commencement of construction of the hydro-electric generating station at Kamchay and Atai and some transmission lines; (2) the rehabilitation and expansion of electri­city supply system in Phnom Penh to meet actual demand; (3) the rehabilitation and reconstruction of electricity supply system in a number of provinces to meet local demand; (4) the construction of receiving system in the border areas to enable import of low cost electricity from neighboring countries; and (5) the provision of electricity in rural areas from privately operated small-scaled generating units in accordance with the licensing arrangements under the Law on Electricity. 71. In the fourth legislature, the Royal Government will attach priority to increase electricity supply capacity and reduce tariff to an appropriate level while strengthening institutional mechanism and management capability. To this end, the Royal Government will encourage the construction of low cost electricity generating plants by using local energy sources such as hydro power, natural gas, and coal. In addition, the Royal Government will explore possibilities of developing high-tech power plants including nuclear and non-traditional energy, and will pursue the import of electricity from neighboring countries. The diversification of energy resources and the creation of the reserve generating capacity in the system are keys to ensure energy security in Cambodia. Moreover, the Royal Government will encourage construction of electricity transmission lines covering all parts of the country to enable the supply of quality and low cost energy from all sources to meet the demand in cities, provinces, urban and rural areas; and will gradually integrate Cambodia’s electricity energy system into the networks of the Greater Mekong Sub-region (GMS) countries and ASEAN. 72. In order to reduce poverty and ensure harmony in the lives of people in the rural areas, the Royal Government will continue to attach priority to accelerate rural electrification, including the use of renewable energy. 73. The Royal Government will accord high priority to encourage the private sector to invest in energy infrastructure, including generation, transmission and distribution. The Royal Government will make further efforts to mitigate adverse effects on environment and society in the implementation of energy projects while safeguarding economic efficiency of each project. Attention will also be paid to capacity building and institutional reform in the Electricity Authority of Cambodia (EAC), Electricity Du Cambodge (EDC) and other relevant ministries and agencies to improve management efficiency and the quality of electricity supply. 74. The Royal Government considers oil and gas resources as a unique potential to ensure energy security and as valuable resources for long term economic development of Cambodia. In this sense, the Royal Government will develop policy, legal and regulatory framework for the sector in order to ensure efficient management and resources utilization for economic development and improvement in livelihoods of the Cambodian people. 75. The Royal Government encourages the use of efficient energy with minimal impact on the environment. 76. In the third legislature, the telecommunication sector has had a remarkable progress through the expansion of the coverage of the post and telecommunication services and Internet, and the increase in the numbers of users. 77. This is a fiercely competitive sector. The Royal Govern­ment will continue to develop the post and telecommunication system and promote the development of information and com­munication technology (ICT) to ensure high quality conforming to international standards, low price and reasonably nation-wide coverage. The priorities are to : (1) speed up the adoption of the Law on Telecommunications and associated legal and regulatory framework; (2) build capacity of the sector; (3) improve and modernize the equipment and technology for the effectiveness and wider coverage of the services; (4) foster competition in the postal and telecommunication services to ensure efficiency of this sector (5) increase the efficient use of IT system and promote e-government, and (6) build and enhance efficiency of the back­bone infrastructure for the information and communication technology sector. 78. The Royal Government has ensured the reduction of business transaction costs, and expanded market access as well as reduced transportation costs and improved travel safety by improving physical infrastructure, thus ensuring integration of rural and urban economies. The Royal Government has developed necessary legal framework for private sector development and strengthened the “Government-Private Sector Forum” to func­tion as an effective dialogue and dispute settlement mechanism. Reduced ‘requirements for documents has facilitated trade and businesses, particularly through the implementation of “Single Administrative Document -SAD” system and “Single Window” service. 79. To facilitate private sector development, the Royal Government will continue to accord priority to improve physical infrastructure through increased public investment in transport­ation networks, including roads, railways, waterways (river, sea), and air routes; to increase the electricity generating capacity and expand the distribution network in urban and rural areas to provide energy at a reasonable charge; to strengthen and expand the modern telecommunication network to make services available at a reasonable low charge; to enhance and widen the clean water supply network; and to enhance and expand infrastructure system for cultural and natural tourism sector. 80. The Royal Government will make further efforts to expand international market access through concerted implementation of its obligations under the framework of WTO, ASEAN, and sub­regional and regional economic integration initiatives. In addition, the Royal Government will continue to: strengthen the supportive legal framework for the private sector including laws and regula­tions, and administrative procedures and improve productivity through training for employees, technicians, and skilled labor; ensure fair competition; promote trade facilitation; enforce the labor law; and, strengthen the dispute settlement mechanism. 81. As an important part of the policy for diversifying the economic base, the Royal Government will promote a favorable climate for developing the agro-processing industry, and assem­bling industry including electronic and machinery assembly. In addition, the Royal Government will continue enhancing neces­sary legal framework, especially creating the law for the efficient operations of Special Economic Zones. 82. The Royal Government will continue promoting the public and private sector partnership for investment especially for phy­sical infrastructure projects. 83. In the third legislature, the number of enterprises and financial institutions increased to 2,400 entities and created 440,500 jobs. More than 50,000 Cambodian workers have found employment in foreign countries. The implementation of Open Sky policy has led to sharp increase in tourists, and job creation. The freedom of trade union has been promoted. Work inspection and conflict resolution mechanism has been tightened to monitor labor law enforcement and ensure decent working conditions. 84. The Royal Government will continue to ensure healthy linkage between trade and working conditions by: effective implementation of labor standards, norms, the Labor Law and international conventions; continuation of the “better factory” project; facilitating workers finding jobs abroad; capacity building through vocational training in response to market demands by mainly focusing on drop-out young students at secondary and high schools, disabled people, women, marginalized groups and minorities; development of a labor market statistical system and national qualification standards; conducting wide public aware­ness campaigns on labor market demands in order to assist labor mobility; and, strengthening existing mechanisms of labor dispute resolution such as Arbitration Council, and, demonstration and strike resolution committees at all levels. 85. The Royal Government will train volunteer arbitrators among local authorities aiming for peaceful conflict resolution. In addition, efforts will be made to ensure: sustainability of job creation and labor law enforcement through training, improved labor inspection at factories/enterprises to raise awareness about labor conditions including hygiene, health and safety; prevention of child labor; the adherence to the norms for foreign employees; freedom of union as prescribed in the Labor Law; and, progress towards adoption of a Law on Trade Unions and the legal frame­work on the Labor Court through comprehensive consultation with all related stakeholders. 86. The Royal of Government has reduced minimum require­ments for the registration of small and medium enterprises and the company registration fee. Accounting system and financial report mechanism have been simplified. Loans provided by financial institutions to small and medium enterprises have increased consi­derably. 87. The Royal Government will continue to improve the business climate for small and medium enterprise development focusing on four main aspects: (1) legal and regulatory framework – facilitating registration particularly via internet system, defining procedures and principles for inspection and certificate of origin for import and export, and adoption of a sub-decree on trade facilitation through risk management; (2) financing – creation of financial leasing companies, and strengthening governance and financial reports; (3) supportive actions for small and medium enterprises – promoting innovation and technology as well as financing for small and medium enterprises, and strengthening and widening other supportive services, (4) integrating small and medium enterprises into a global value chain and preventing all kinds of smuggling. 88. In addition, the Royal Government will promote imple­mentation of new measures including: establishing of the National productivity Center in order to improve productivity and reduce production costs; establishing a National Standards Institute to ensure product quality conforming with regional and international standards; establishing national testing laboratories for physics, chemistry, micro-biology, and mechanics in order to evaluate quality and set prerequisite criteria for products; strengthening industrial property rights protection mechanism in order to promote innovation, adoption of new techniques and new tech­nology; imparting training to improve skills; and, strengthening the relevant legal framework. 89. The Royal Government continues to promote the “one village-one product” movement by encouraging inventions, entrepreneurship, and self-confidence in rural areas. This move­ment provides a comprehensive network linking production to the market, helps maintain regional identity, and encourages new initiatives for product diversification. The Royal Government will promote technical training for special products within some regions in the context of strengthening quality and expanding markets which are critical for further support to and participation in this movement. 90. During the third legislature, the Royal Government suc­ceeded in rescuing, and providing support to, a large number of vagrants, vulnerable women and children, people with disabilities, victims of human trafficking, and victim families of natural disasters. These people have been provided with training and jobs to survive on their own. 91. The government has cooperated with national and international organizations and all relevant institutions to provide employment opportunities for, and reduce vulnerability of, the poor. Also, the Royal Government has improved and strengthened social safety nets for retired civil servants and veterans by increasing pensions and other benefits. 92. To continue to implement social safety policies, the Royal Government will: give priority to improve working conditions for workers and employees, enforcement of Social Security Law, implementation of the principle of benefit and pension scheme for people with disabilities and their dependents; ensure protection of those covered by the Labor Law; and make available to all employees insurance coverage against workplace accidents. The Royal Government will continue to strengthen support to people with disabilities and families of veterans who sacrificed their lives for the nation. Furthermore, the Royal Government will continue to support retired civil servants and veterans through implementing a comprehensive pension system under the National Social Security Fund. In this context, the government will work towards promulgation of a “Law on the Comprehensive National Social Security Fund” and a “Law on the Establishment of National Pension for Veterans”. 93. The Royal Government has achieved remarkable progress in implementing the “Education for All” strategy by ensuring equity and the basic nine year education for all children. Other major achievements include the gradual increase in the number of schools and teachers, the enrollment rate at all levels of primary and secondary education, particularly in the rural areas. Lower secondary schools have been built in almost all communes/sang­kats in the whole country. The number of technical and vocational training schools, universities and teaching staff increased as well. Meanwhile, the government has substantially increased budget for the education sector for which current budget expenditure has doubled in 2007 from 2003 level, accounting now for 19.2% of total current budget. The government has achieved remarkable progress in improving partnership in education with development partners including NGOs and the private sector. 94. 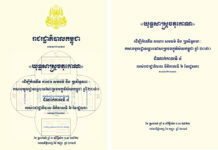 In the fourth legislature, the Royal Government will continue to implement the Education Strategic Plan, emphasizing on ensuring that all Cambodian children and youth should have equal opportunity for access to basic education, both formal and informal, without discrimination on grounds of race, skin color, gender, languages, religion, political affiliations of parents, place of birth and social status. Equally, the implementation of the Strategic Plan is linked to imparting a culture of peace, respect for human rights and dignity, respect for the principles of freedom, democracy and justice, and instilling a culture against violence, drug use, child and women trafficking and social discrimination. 95. The Royal Government will pay attention to improve the quality of education by: providing. incentives to teachers; improving curriculum; encouraging outstanding students; training teachers and upgrading teaching methodologies; improving class room conditions and learning materials; and, establishing libraries and laboratories. In order to ensure equitable opportunity, the government continues to establish dormitories for students, espe­cially female students; to build schools for all levels, particularly in rural and remote areas; and to increase scholarship for poor students. As well, the government will continue to train qualified teachers in an adequate number and effectively implement teacher deployment policy. The government will encourage teachers who work at primary and lower secondary schools and who have obtained bachelor degree at any age to take an exam to become high school teachers; and allow primary teachers who have not completed high school take an exam to obtain equivalent certi­ficate of high school graduation. It will provide them an opportu­nity to study at bachelor as well as post-graduate levels and will increase basic salary. 96. The Royal Government will continue to strengthen its partnership with private sector and the national and international communities to enhance and improve the quality of education services paying more attention to information and foreign language training at all levels of general education, technical and vocational training, and in higher education as well, consistent with international standards and the country’s development needs. Equally importantly, the government continues to pay attention to technician and engineer training through technical and vocational training schools and higher education. As well, in order to reduce the gap between demand and supply for jobs, the government continues to implement the vocational training policy linking with labor market in close cooperation with relevant parties through the following measures: (1) provide basic skills training to people in rural areas to increase income; (2) provide training or skill improvement to factory workers in cooperation with employers; (3) continue to expand technical and vocational training to provinces/ municipalities, including entrepreneurship training program; and (4) establish National Agency for Profession and Employment, and Employment Centers in provinces/municipalities as a mecha­nism for dissemination of labor market information. 97. The Royal Government will continue to expand informal education through literacy and vocational programs, establishment of community learning centers and implementation of equity programs. The government will increase budget allocation for education and mobilize more financing to support education to ensure higher and effective quality of education. 98. The Royal Government considers that healthy people constitute the key basis for human resource development and sustainable socio-economic progress. The Royal Government has placed emphasis on enhancing the general well-being of all citizens, particularly the poor, women and children. As a result, infant mortality rate decreased from 95 to 66 per 1000 live births during 2000-2005. Under-five mortality rate has also declined remarkably while maternal mortality rate has decreased only marginally from 472 to 437 per 100,000 births. In 2005 more than 65 per cent of pregnant women received pre-natal care from trained personnel at least once. The HIV prevalence rate has declined dramatically. Data from the Cambodia Demographic and Health Survey 2005 (CDHS) shows that only 0.6 per cent of Cambodians in the cohort age group 15-49 were HIV positive, declining from an estimated 1.9% in 2003. In the third legislature, the current budget for health has doubled from 2003, accounting for about 10 per cent of the total current budget in 2007. 99. In the fourth legislature, the Royal Government will continue to implement the Health Strategic Plan to reduce maternal mortality rate and infant mortality rate, and improve other health indicators by enhancing and expanding health services, especially reproductive, maternal, and infant and children services. 100. The Royal Government is focused on the implementation of the program for prevention and cure of communicable diseases; construction of referral hospitals and health centers throughout the country that could provide effective, equitable and sustainable basic health services; and enhancement of quality of health professionals. The Royal Government will ensure better distri­bution of doctors, medical workers and midwives in the health system; increase allowances for health staff working in rural areas; and increase the number of doctors, medical workers and midwives. The Royal Government will continue to pay attention to health and sanitation education; widely disseminate health information especially in rural areas; and provide services to the poor through the Equity Fund and health insurance system. 101. The Royal Government will continue to take measures to: make health services more responsive and be available closer to people through decentralized service provision and devolution of management authority to sub-national levels such as national hospitals, referral hospitals and health centers; increase investment in physical infrastructure, medical equipment and technologies; enhance support services and health research for policymaking, planning, performance monitoring and evaluation; and, strengthen governance in the health sector by implementing the Sector-Wide Approach emphasizing on national ownership and partnership with the international community. Also, the Royal Government continues to promote private sector participation in order to increase investment in health sector and strengthen public health intervention. 102. The Royal Government considers women as the backbone of the society and the economy. The Royal Government .has succeeded in implementing the Strategic Plan “Neary Ratanak II”. The government is implementing the Law on Prevention of Domestic Violence and Victim Protection and the Law on Anti­human Trafficking and Commercial Sexual Exploitation. The Royal Government has reduced the gender gap in the education sector through increasing enrolment rates for girls. In terms of health services, the Royal Government has also improved the overall access to primary and reproductive health, prevention of malaria and HIV/AIDs. In the economic sector, the Royal Govern­ment has defended the rights of female employees through advo­cacy and policy interventions. Moreover, women are being equipped with skills and they have the capacity to participate in decision making at all levels of governance. In general, the pro­portion of women elected as members of parliament increased to 19% in 2003 and, in 2007, 15% of elected members of commune council are women and currently 30% of village chiefs are women. 103. The Royal Government of the fourth legislature will continue to implement its policy aiming at increasing education opportunity for female students through increased scholarships, additional training programs, providing accommodation and safe transportation, and increasing the number of female teachers. The Royal Government continues to increase women’s role and capacity in decision-making at all levels of governance and pays attention to skills training for women at all levels. The Royal Government will strive to increase the ratio of women at all government levels, by providing employment opportunities for women, using advocacy at the village and commune levels throughout the country, and by protecting working rights of women. 104. To contribute to poverty reduction, the Royal Government continues to provide small and medium credits to women and communities for their livelihoods. To prevent violence against women and human trafficking, the Royal Government will effectively enforce the Law on Domestic Violence and Protection of Victims by providing effective and timely legal protection to victims, who are mostly women and children, in collaboration with all relevant institutions and development partners. 105. Preliminary results from the ten-yearly population census conducted in March 2008 place the total population of Cambodia at 13.4 millions, with a male-female ratio of 51.5 % and rural urban ration of 19.4% and 80.6%. This shows also an average growth rate of 1.54% per annum during the decade. The main achievements under population policy implementation were (I) most women are aware of birth spacing control; (2) total fertility rate decreased from 4.0 in 2000 to 3.4 in 2005; and (3) the average number of desired children per woman is 3.3 which will lead to decrease in the average family size. 106. In the fourth legislature, the Royal Government will continue its efforts to integrate the population policy into socio­economic policy, plans and programs at all levels. 107. The Royal Government continues to introduce necessary measures to enhance the quality of people through developments in education, health, gender equity, and rural development as priority. With 60.8% of Cambodian population aged below 24 years of age, it is important that we adopt measures to turn youth to be an important driving force for development of all sectors. The Royal Government will strengthen urban and agglomeration management to make cities clean without litter, with full sanitary facilities, with fresh air, green park and gymnasium complexes; and organize cultural entertainment publications to support enhancement of quality of physical and moral human health. 108. In the first phase of Rectangular Strategy implementation, Cambodia has achieved political stability, high economic growth, macroeconomic stability, increase in investments and substantial inflows of foreign direct investment, though there are unforesee­able external challenges such as the global imbalances, including financial crisis, and hike in food and fuel prices. 109. Only in a short time, the Royal Government has attained remarkable progress compared to some other countries that needed many decades to reach where we are. Meanwhile, the Royal Government acknowledges that, in the road forward to achieve the vision in the Rectangular Strategy, Cambodia may face chal­lenges and obstacles which require the whole nation to function in a dynamic manner using competitive advantage in order to move faster and more effectively. However, based upon past achieve­ments, high potential, firm determination, available and growing talent with high learning capacity, acquired experiences, quick ability to adjust and adapt, timely measures being taken by the government and the entire people, and appropriate future stra­tegies, the Royal Government is confident that Cambodia will overcome challenges and obstacles that lie ahead. 1. Sustainability, peace, political stability, security and social order to promote rule of law and protect human rights and dignity and multi-party democracy. 2. Sustainable long-term economic growth at a rate of7% per annum on a broader basis and more competitive capacity in the context of one-digit inflation. 3. Poverty reduction at a rate of over 1 % per annum, and improvement of main social indicators, especially in education, health and gender equity. 4. Increased outreach, effectiveness, quality and credibility of public services. 111. I have introduced the “Rectangular Strategy – Phase II” as the socio-economic policy agenda of the “Political Platform” of the Royal Government in the fourth legislature of the National Assembly. This strategy, to be implemented mainly through the National Strategic Development Plan, will be our means to further pursue our vision of building a Cambodian society which enjoys peace, political stability, security and social order, and sustainable and equitable development, with strict adherence to the principles of liberal multi-party democracy, respect for human rights and dignity, and a society in which social fabric will be strengthened to ensure that the Cambodian people are well-educated, culturally advanced, engaged in dignified livelihood and living in harmony both within family and society, and that can enable Cambodia to reclaim its glory in the international arena. 112. I would like to call upon all our development partners, including bilateral and multilateral development partners, private sector, non-governmental organizations, as well as management and officials of ministries and institutions, legislative and executive bodies, courts, armed forces, local authorities and people to provide full attention and strong support and actively assist the Royal Government of Cambodia to implement our policies and programs under the “Rectangular Strategy – Phase II” . 113. Let me say once again that the people of Cambodia, out of conviction and confidence in us, have elected us to govern and serve for another five years. We bear sacred responsibilities on our shoulders to live up to our peoples’ expectations and to deliver to them peace, stability, progress and prosperity. We have to strive hard as a united, well-coordinated and harmonious team to face all the challenges ahead. I urge on all of you to work in this spirit for our common goal, setting aside individual preferences and differences, keeping always in mind the picture of the ordinary Cambodian family – husband, wife, children and aged parents ­who struggle for daily livelihood and whose lot we have been elected to improve. Our tasks ahead, especially removal of poverty will not be done in a day or a year. Sustained and concerted action is needed on all fronts to continue to achieve progress. 114. There is no goal more sacred than improving the lives of our people and no other task more rewarding. It is not for our rhetoric but for our record of good and progressive work that we will be remembered. Good, selfless work in the cause of upliftment of our people is its own reward and will surely earn merits for our lives. Therefore, I once again urge you to take up the tasks ahead of us with utmost earnestness, sincerity, devotion and to the best of your abilities. 115. I invoke the four blessings of Buddha on all of you for fulfillment in your personal lives and success in your work for the nation. Our work to implement the “Rectangular Strategy ­Phase II” starts now and the clock will tick away fast.